8 lessons from my experience giving to the homeless. After 13 years working and volunteering in community services it almost feels strange for me to say I’ve never had the experience of preparing lunch bags and handing them out to the homeless. I was scared at first, well mostly nervous because I didn’t know what to expect. We teamed up with our friends Kal who runs Compassion in Motion and Monique owner and CEO of 4 Accents clothing. Both women give back to the homeless on a monthly basis so they were experts in my eyes. They gave us advice to be aware that not everyone will be friendly or want what you’re offering but when you get to speak to some of the people and hear their stories you will forever be touched. They also sent some volunteers love notes and tips to help us understand the dynamic a little more as well. Two days before, Shawnna, my best friend and I shopped for what was needed we quickly realized just how good it felt to be in the position to give back. Fast forward to Sunday August 20th I felt tired as it was 9 am and I only slept for a few hours but deep inside the butterflies were finding its way back into my stomach while preparing lunch bags with fruits, snacks, juice, water and sandwiches. All these thoughts were building “How will this go?” “What if people are mean?” All these thoughts without any real logic behind it, but it felt sensible enough to get me to second guess a serious effort. Luckily, instead of being derailed the energy of the volunteers and the excitement to give back filled the room and the butterflies left. Once we completed putting the bags together we drove downtown to Nathan Phillips Square, we met with Randell another volunteer who gave us a rundown of how to outreach and the route we’d take which was short from Nathan Phillips Square to Moss Park but at the same time long because we would meet so many inspiring people along the way. The first person I saw I asked Randell to approach because I wasn’t sure exactly what to do. “I’m Randell whats’s your name? He was friendly and interested in talking to us. He said he’d be leaving on Wednesday to go to Vancouver, British Columbia and to St. Johns, Newfoundland for the next while because he felt sometimes you need to get out the city for a bit. We definitely could relate! He named about 30 states he had travelled to including visiting Key West but he also expressed his upset with the government for bringing in so many refugees and providing housing to them but not to the homeless. Although he was quite upset he stopped and said thank you for hearing me out and laughed. “It’s nice what you’re doing I really appreciate it”. As he said that, Shawnna came over and asked what to do if someone wants to give money towards what we’re doing, and there was a lady who was offering $20. Lesson 1: You don’t have to be on the frontlines to give back or create change, but compassion is an energy that attracts more compassion and people will feel that and want to be involved. Lesson 2: You don’t need to believe everything, but you don’t have to communicate the energy of not believing. Let people tell their story because their truth doesn’t have to match yours. Continuing our walk along Queen Street, we stopped at the intersection at Bay St. where I met Jeff. Jeff had a sign and no teeth, he had an amazing spot to ask for change and he had two notebooks with drawings. He appreciated the lunch bag and what we were doing as well. I asked what he was drawing and he showed us a few pictures explaining that they were skulls but not typical skulls, they were Alien skulls because he wanted to do something different. Randell asked if he ever sold it and he said one guy offered him $50 for it but he wasn’t finished so he said he couldn’t sell it to him, when I asked how come he said it wasn’t about the money it was about his integrity he wouldn’t feel right selling someone an unfinished picture especially because when you give someone your artwork it needs to be complete or they won’t get the entire piece. He also mentioned that he loved outer space, the stars, aliens and planets, he’s always loved that stuff. He said he’s so thankful to be able to draw, so thankful to be here living and able to see. Jeff reminded us that we should be thankful to have every single thing we have. He said thank you for the conversation, most people don’t really talk to me but you guys are doing something great. Lesson 3: Jeff is an Angel, and sometimes the most beautiful things come from seemingly hopeless places. I’m forever thankful to have met Jeff whether he remembers me or not. Lesson 4: Conversation is an exchange of energy much less an exchange of words. Language should never enable us to limit the exchange of powerful energy as it does typically, feel the conversation and you will always receive a clear message. 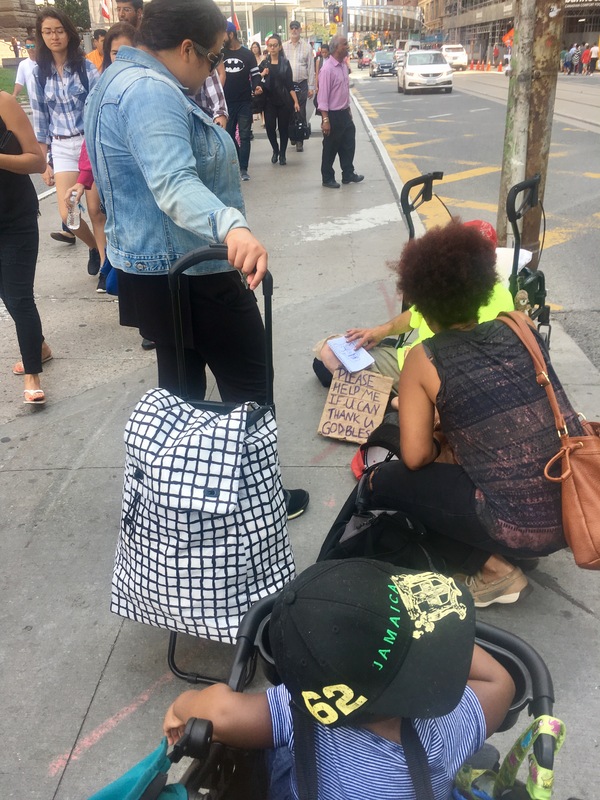 Continuing along Queen Street, we stopped a few times to provide a water or a lunchbag, not everyone wanted to chat, we respected their wishes and moved along. When we arrived at Metropolitan Park there was a combination of patients from St. Micheal’s Hospital next door, the homeless and some people just grabbing a seat because it was a hot day. We walked up to a few people and stopped to say hello to Will and Tyrone aka Funky Tyrone (stage name). Will actually had an assortment of gifts for us to give Kal, because he wanted to show how much of an impact she had made on him. Tyrone was one of those cool cats, at least that’s the only way I could describe him so you get the picture he looked like a musician (which he was) and told us that he would be doing a show this Friday at Yonge and Eglinton. You could see they had a genuine friendship, Will shared that Tyrone taught him to play Chess and Tyrone chuckled that Will still can’t play but he was pretty bad before. They both had such a warm energy to them. Will spoke about finding the church in front of us about 9 years ago when he was at his worst and it changed his life forever, he asked me if I believed in Jesus and I said, well I’m not sure but I believe he exists, and he said well I know everyone believes Jesus is so great but I believe Moses is really the one whose great because he had more powers. I said I understand what you mean by that I just believe we all can access the power of God within ourselves and that we can pull on different powers like superheroes, he said that’s right because we’re all energy and God is energy! See that’s why I like Batman, he was even stronger than superman. We continued to talk for at least 20 minutes before realizing the rest of the group left. Lesson 5: The truth is quite simple, but our perspectives adjust it to become truer to ourselves and coupled with language we complicate it in a way where we find it difficult to understand and even harder to understand each other. Strip away the words and what you will always find is the word, the truth is that simple. Randell was caught up in a conversation with a man by the name of Olu (an older homeless man she met some years back) I joined her after saying goodbye to Will and Tyrone. We listened to Olu for another 10 minutes before we realized we were down to two lunch bags so we said goodbye with the intention to meet up with the rest of the group to get more. We continued walking only to stop a few steps later where we met Greg, who was grateful for an extra bag of chips, something in his eyes and his thanks let me know that he needed it more than I’ll ever know. We chatted with Bala, Tony and Jim, three guys having a nice and easy conversation about working for what you want. They reminisced on different parts of their life and bickered the way a couple would, you could see that it didn’t matter where they were, they had each other’s’ back, that’s what you call community. Lesson 6: In the eyes and the energy you can sense gratitude. Sometimes you never know what impact a person can make on you and what impact you can make on them. Lesson 7: True communities are formed through understanding of a common experience, we cannot fake community due to location only but we must share something in common or at least share understanding. We met back up with the group and exchanged stories and experiences, everyone smiled, you could see their hearts were filled and so was mine. Each of us touched by the experience and forever changed. Thank you to Compassion in Motion and 4 Accents for the partnership, Thank you to ShawnnaMelonTV for coming up with Small Change Big impact and a huge thank you to Lobely, Diyanah, Alicia, Randell, Shawnna, Odain and Noah for working together to give back. Lastly and lesson 8 of this experience is that I am super thankful for being able to give and to have, Thank you God, my spirit squad and the universe for making this possible and pairing me with the best people to share compassion. Stay tuned because there will be another! Previous Dating is about you, show up or stop looking. Next Embracing your Start Somewhere.